Neoantigens are mutated peptides that are expressed by tumor cells, but not by normal tissue. As a result, they can be recognized as foreign antigens by cells of the immune system — making them promising targets for personalized cancer immunotherapies such as vaccines and adoptive cell therapies. However, because neoantigens can arise from somatic mutations occurring in any gene in the genome, neoantigen identification requires both exome-scale DNA and RNA sequencing. NeoantigenID, advanced analytics available via the ImmunoID NeXT Platform, leverages this DNA and RNA data to make accurate neoantigen selections. 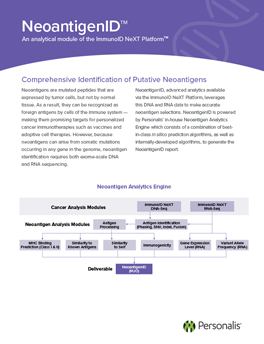 NeoantigenID is powered by Personalis’ in-house Neoantigen Analytics Engine which consists of a combination of best-in-class in silico prediction algorithms, as well as internally-developed algorithms, to generate the NeoantigenID report.